George Fagan is a founding partner and principal of Leake & Andersson, and works at the firm’s New Orleans office. He is the Firm’s practice group leader for commercial, employment, insurance and professional liability litigation and consultation. 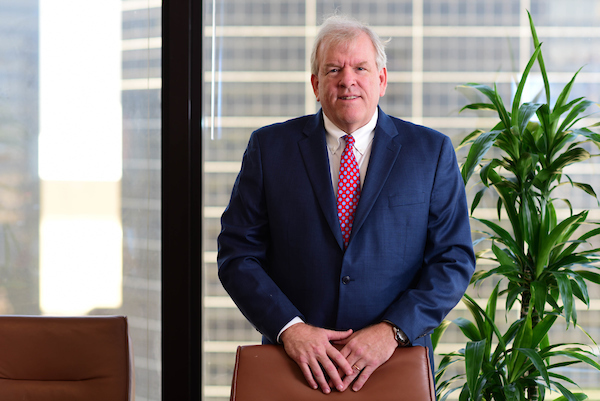 George has tried over 30 lawsuits in federal and state courts in Louisiana and Mississippi, and over 20 arbitration hearings and proceedings throughout the United States. He has argued over 40 appeals in state and federal appellate courts. George regularly speaks, chairs panel presentations and publishes papers and articles on topics in his areas of practice, as well as e-discovery, ethics and document retention issues. George’s commercial practice includes business, construction, intellectual property, real estate and securities litigation. His employment practice focuses on discrimination, harassment, whistleblower and wrongful discharge matters as well as employee and group benefits/ERISA litigation. As to insurance, his practice involves bad faith, construction defects, disability, EPL, errors and omissions, executive liability/D&O, life and health, professional liability and property litigation. George has been included in the Best Lawyers in America listing for over fifteen years. He is “AV” rated by Martindale (highest rating). George is a member of the Federation of Defense and Corporate Counsel and the Council of Litigation Management. George was recognized with the ALFA International 2011 Nathan Fishbach Service Award for his outstanding individual contributions and leadership to ALFA International, a global legal network consisting of over 10,000 lawyers in 85 U.S.-based law firms and over 60 international law firms. George has held leadership roles across several practice groups within ALFA International, chairing both the Insurance and Labor & Employment Practice Groups. He has also served on the ALFA International Board of Directors, Executive Committee and several other committees. On January 5, 2012, the New Orleans CityBusiness publication announced its selection of George Fagan as a member of the Leadership in Law Class of 2012 based on his professional and community achievements and contributions. Mr. Fagan has been selected for inclusion in the 20th Edition of The Best Lawyers in America in the practice areas of Litigation – Labor and Management and Insurance Law. George graduated from Washington & Lee University with Honors in 1981, and received his law degree from Louisiana State University Law School in 1984. He is a member of the Hall of Fame of LSU Law School, served as a board member and then officer of the LSU Law School Alumni Board (1991-2000), and also served as President of LSU Law School’s Student Bar Association during his senior year (1983-84). George lives in New Orleans with his wife, son and daughter, and plays guitar in a rock n’ roll band with some very good friends, as he has done since he was a teenager.